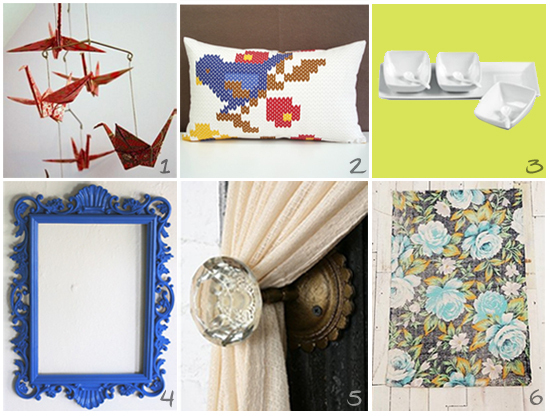 I would like to help you get your week off to a cheerful start by presenting "Fabulous Finds." Here I will be posting my fabulous home decor/kitchen finds from various websites. If you are fairly frugal like me, you will love that everything below is priced at $30 or less! Many of the items posted are from Etsy or are listed on sale at other websites. So, if you like any of the fabulous finds act fast, because I'm not sure how long they will be in stock. Below the photos you will find a link to each item listed, have fun browsing! Oh, and if any of you have a favorite website or Etsy shop where you have also found fabulous items for the home please share them with me, I would love to check them out!